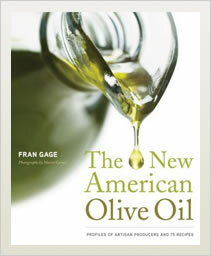 Here is the first book that celebrates America’s artisanal olive oil producers with profiles of growers and seventy-five tempting recipes. In addition, there are tips for choosing and storing extra-virgin olive oils, understanding the basic types of good oils, and even how to host an olive oil tasting. 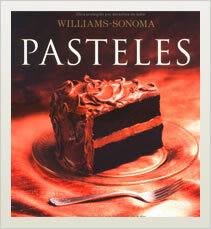 This book is a chocolate lover’s delight. Written with artisanal chocolatier Michael Recchiuti, it includes detailed recipes for his famous chocolate confections, as well as snacks, barks, drinks, sauces, and ice creams. 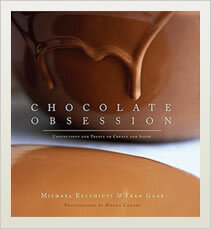 Chocolate Obsession won a 2006 IACP award for photography and styling and was a James Beard Award finalist. “Chocolate Obsession is essential for any cook—from novice to maven—who aspires to create world-class chocolate confections. The book is a treasure trove of seductive, one-of-a-kind recipes, meticulously re-created for the home cook, clearly and simply written, and generously infused with tricks of the trade in delicious detail. This is a ground-breaking work; Fran and Michael explain the secrets of chocolate and lead the reading cook into a realm normally reserved for professionals. I am thrilled to have this inspiring resource in my own kitchen. . . and I can’t wait to get my hands back into the chocolate! “ — Alice Medrich. Cakes of every description, and for any occasion, are represented in this book, from a humble Carrot Cake to an elegant Rolled Chestnut Cream Cake. The book also includes cakes in individual servings—Chocolate-Orange Cupcakes, Hazelnut Dacquoises, Chocolate Vacherins, and Babas au Rhum, plus tips for decorating. 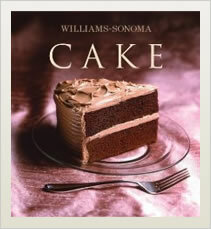 The Spanish Language Edition of Cake. A Sweet Quartet celebrates the DNA of desserts in essays that describe how these elemental ingredients find their way into the kitchen. The stories include visits to the sources—sugarcane fields, orchards, hatcheries, and creameries—and end with recipes that profile each ingredient. 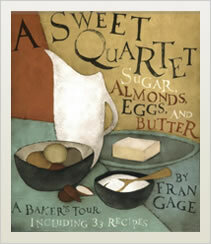 A section of the Sugar story was included in Best Food Writing, 2003. 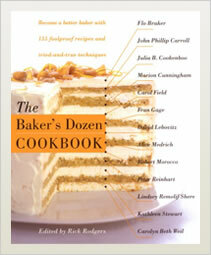 Thirteen members of The Baker’s Dozen, a collection of California baking enthusiasts led by Marion Cunningham, pooled their collective knowledge to produce this book. In addition to recipes for cakes, pies, tarts, fruit desserts, cookies, muffins, popovers, quick breads, doughnuts, yeast breads, flatbreads, custards, frostings, glazes and sauces, it contains comprehensive glossaries of ingredients and tools. 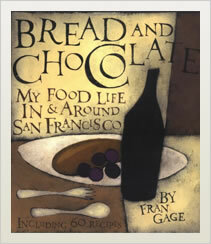 Stories about food, part memoir, part exploration, shape this book. The focus is the bounty of San Francisco's Bay Area, from artisanal chocolate makers to microbakers, and each essay includes recipes. Vegetarian Turkey was included in Best Food Writing, 2000.